Food rescue does not involve superheroes in capes. Also called food recovery, it is the practice of retrieving edible food that would otherwise go to waste and distributing it to those in need. In most cases, the recovered food is perfectly edible, but not sellable. For example, it’s day old bread or bagged lettuce past its “sell-by” date. Often, it’s in great shape (as you can see in these photos). 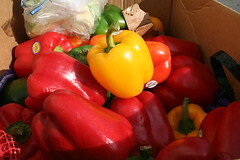 The food that recovery agencies pick up is donated by supermarkets, restaurants and farms. 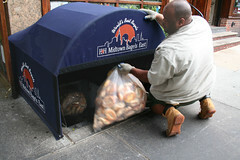 In most cases, the rescued food is being saved from the dumpster and, ultimately, the landfill. Food recovered on farms is kept from being plowed under. On farms, the donations often must be harvested, or gleaned, by volunteers. Businesses that participate receive tax benefits for their donations, freedom from liability lawsuits thanks to the Bill Emerson Good Samaritan Food Donation Act and the warm, fuzzy feeling that comes from doing the right thing. Heck, you may even receive positive publicity in the local press and on this site. If you’re a restaurateur, supermarket supervisor or farmer who doesn’t enjoy throwing away food, there’s probably a food recovery organization near you willing to pick up your extras. The US Department of Agriculture used to operate a phone line 1-800-GLEAN-IT) to provide assistance in finding food recovery agencies. But since they now redirect you to the private non-profit, the Society of St. Andrew, you may as well just call those helpful folks at 1-800-333-4597. If you’re just an interested party, you can still help. It’s easy and rewarding to get involved. As a volunteer, I have gleaned unharvested crops and picked up supermarket and from supermarkets. I’m currently trying to find food donation sources for a homeless shelter. hola my name is kelley and im in the seventh grade. Our class is apart of project citizen, it is where you find a problem in you community and try to fix the problem. I am writing to you today to ask your help. 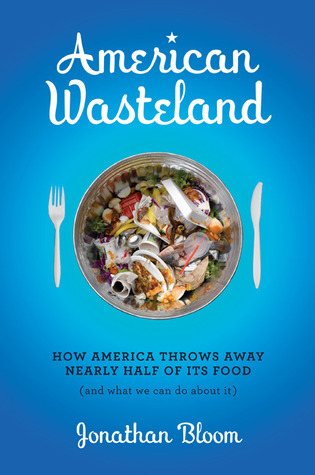 We are trying to find alternative ideas for the use of food waste. Could you please tell me some ideas that are taking place to use up food wastage. Thank you for your time just email me back at the above email adress! Kudos to you for being aware of this problem in our country … the US already produces enough food to feed every citizen, but so much of it is wasted. I work for the Food Bank of Central New York, and we encourage our member food pantries to run an “open choice” pantry, letting families pick what they need and want instead of prepacking boxes. We also run a service called “Second Helpings,” where prepared, uneaten food is frozen for us by restaurants and caterers — we pick the food up and deliver it directly to our member soup kitchens, emergency shelters, and other places that serve hot meals to those in need. Our “Fresh Foods” program picks up donated perishables daily from grocery stores and delivers them to sites where people wait hours for the chance to take home fruits and vegetables, milk, juice, etc. Finally, we work with local growers wherever possible to glean their fields after their harvest, bringing what won’t be sold to people who can’t afford to buy. Thank you for helping us spread the word about getting good food to those that need it! What about adding Food Not Bombs to the list of Food Recovery Groups? Glean it, cook it, give it away! Good point, Jon. I’ve been delinquent in getting those links up; There are so many worthy groups. Just call me a de”link”quent. Hi, I’m soon to become a restauranteur and would love to donate food rather than waste it. Do you know of any similar food wastage collection schemes in the UK/London? I can’t seem to find any. I love the work you are doing and the light, refreshing tone of your blog. I can’t wait to read your book! I’m sure you know about the Food Bank for New York City, which is a little different from the food rescue operations described here. They often receive food a few months /before/ the expiration date: the companies producing it consistently overproduce and know they won’t be able to distribute the cereal, crackers, tomatoes, rice, etc. in time for the date on the box. Lucky for food programs in NYC, the manufacturers donate it to the Food Bank, but I’m sure there are tons of food in America that don’t end up in such an honorable place. I spent a fascinating Saturday there a few weeks ago: http://fixproject.squarespace.com/fix/2008/3/6/food-rescue.html. Scrambing Eggs, I would contact defra about UK recycling. Megan, thanks for sharing that interesting recap of your volunteering. For those who haven’t already done so, I’d recommend reading it. Hi, Jon. I’m really glad to see what you’re doing. I’m old and I was raised by parents and grandparents who lived through the Depression of the 1930′s. They planted gardens and routinely canned and froze their produce. They had small orchards on their suburban lots. My grandmothers supplemented the produce they raised by going directly to the local commercial truck farms and orchards. One of them routinely sought out the “overripes”, especially in peaches, partially because they were cheaper (prone to spoil sooner, so had to be worked up quickly) but also because they were the most flavorful. These were not poor people. By the time each of the grandparents were of retirement age, they had accumulated enough capitol to die as near millionaires. Indeed, it was the pattern of not wasting food, or anything else usable that allowed them to ride out the Depression, and even to prosper in the process, and to expand their well being in the relatively stable economy which followed. Having grown up in the tradition, I follow it myself, and I absolutely love the out of date meat, produce and dairy products sections of our local supermarkets. I couldn’t tell you how much it lowers my food costs to use them. Now you have added another reason for feeling virtuous in the process–reducing food waste. However. As a former teacher in an Alternative school, which obviously drew many of its students from disadvantaged families, I observed that many of my students disdained eating fruit with a small bruise, bananas with a couple of black spots, or anything else that hinted that it might be “for poor people”. Even my own sons (now in the 20′s) have some tendency to turn their noses up at food they perceive as wilted or blemished, although they don’t refuse to eat the pies, cakes, casseroles or other tasty products I offer them which are based on the overripe, out of date stuff. School feeding programs drive me crazy because of the quantity of food that simply gets thrown away because the kids don’t like it. (they have other problems, but they are outside of this post). The current program says that the plates have to be served offering 1/4 of a child’s nutritional needs. Most schools (maybe all) serve it all at once, and what they don’t eat, is tossed. Why not offer smaller portions, especially to younger children, then allow them to return for more if they want it. Also, when I was young, there was a pig farmer who came to the school daily to pick up the scraps from barrels the kitchen staff placed by the back door. I don’t know whether he paid for the privilege, or just cut down on the amount of stuff that went into the dumpster, but in either case, I’m sure he saved money on his hog feed bill, while also finding an alternative use for perfectly edible food. Ultimately, what I’m saying is that there has been a cultural change over the course of the last fifty years which is not to the advantage of the planet as a whole. I don’t know the wherewithalls to make it happen, but your blog is part of the process of making it change back to what was once the norm–make it last, make it over, use it up or do without. Unfortunatly, necessity is a mother, but also seems to be the best teacher. I’m afraid people in the developed world are going to have to get a lot hungrier before they start making much of a change. Your blog is great, I love keeping up on the subjects you offer, I’m passionate about food rescue and the depletion of food waste too! I work at a food bank in Southern Indiana where I have become more involved in food rescue and hunger issues than I could ever imagine. This summer I am beginning a Gleaning Project in which I am recruiting volunteers to help us tend and glean the fields of a local farmer so that we can obtain more produce. Ideally, in the future we will have many farms on board and can establish a natural relationship with local growers so that no local harvest will be wasted. As part of my media release about the project, I’d like to have some substantial facts of food waste in reference to farms and agriculture. Do you know of a good place to start? Thank you for all that you do and keeping me clued in to food waste issues throughout the media. I live in a rural area of Virginia,where every fall I see tons and tons of tomato’s,simply poisoned and burned.I have spoke with a few farmers who tell me it isnt profitable to pick them.There has to be something that can be done about this.It seems like such a senseless waste to me. I am definatly interested in finding a solution to this.If anyone has some idea’s please share them with me. Glad to hear you’re taking action. How is the project going? If you’re after facts, I’d look for research by Timothy Jones and you can always click on the farm tab on the sidebar of this blog. You should call the Virginia Society of St. Andrew at (434) 299-5956. They can usually convince farmers to let them harvest these unwanted crops with a volunteer crew. Hopefully, you can be part of the solution! I only had enough time to read a few things, but I love the blog. Currently I work for a humanitarian/mission organization (mercyships.org – on the Africa Mercy: its a large floating hospital currently in Monrovia Liberia) and I run the galley/kitchen. We serve food twice, original cooking and reheat for leftovers…after that it is dispersed for local day workers on board the ship so they can carry it home (including leftover meat scraps, vegetable peelings/scraps, you name it…). After that, if its not usable it goes to our compost projects in our agriculture ventures (community gardens and training for farming in the community) or ‘fish food’ literally. Now when I am back in the states making money to fund my next volunteer work it pains me to see the waste. Good job for bringing the awareness! Sorry for writing a mini article. Oh, I should point out that I did not explain that the unsellable food I was able to procure from grocery stores was when the ship was back in the states in between outreach breaks…not in the Caribbean. It was easier for them to unload on me, than to fight people at the back doors trying to fight over the food…it causes such a problem that’s why they turn to just dumping it in a locked garbage container, but organized pickup by ‘qualified’ venders (such as rescue missions, salvation army, etc..)helps the process. This is a great site. We recovered 6 garbage bags filled with artisan bread tonight along with bags of cheese, organic chicken, apples, etc. The recoveries are all bittersweet knowing that in dumpsters all across the country there is so much good food, and so many hungry people. For us we are blessed to have a kitchen that graciously takes the food and redistributes to those in need. They feed people of all ages and operate 6 days a week. I look forward to reading your book. And my sincere thanks to all those involved in food recovery. Let us all put forth our best efforts to end the waste and help those in need. Hartford Food Not Bombs serves healthy food that would otherwise go to waste at the Bushnell Park Carousel every Saturday and Sunday at 3:00 pm. There are many other Food Not Bombs chapters all over CT and the world. To get involved in your area or for more information, email hartfordfnb@gmail.com or call 860.978.7047. This is such a wonderful site and discussion. Thank you so much for all the energy you put into it. I am in the process of writing a business plan for a venture that will recover food and pick up food scraps. We will cook what’s safe to eat into soups or fruit spreads (less sugar and pectin than jams) for sale or donation to our local soup kitchen. The rest will become compost to be given back to farmers who donate their unsellable produce. Our endeavor will train students and the unemployed in such skills as delivery and pick up, e-sales, culinary arts, web page design, and marketing. I appreciate any helpful ideas, suggestions, links to others doing something similar, and–of course–anyone wishing to join us. I wish you good luck and lots of patience. Where will this venture be? Let us know, as I’d love to follow your progress. Also, I think it’d be very useful for others thinking of doing the same to hear about what it takes to start a food recovery operation. If you’re going to sell stuff, I’d suggest targeting the high end market, maybe at farmer’s markets and local shops. You could make some funky jams, spreads and sauces. If it’s clear the proceeds are going to your cause, I think people would be happy to buy it. Even more so if the stuff is good! 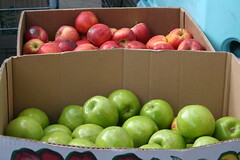 I’ve started my own awesome project of fruit gleaning and collecting produce at farmers’ markets. I’ve worked for free for about 1500 hours this year. So, I’m not sure how to break even if someone were to hire out. I’ve averaged about $75K of produce donations in less and a year – all in my family SUV, a Honda Pilot. Lots of news about my project. I started a blog to share information. Enjoy. BTW, Jonathan – great blog. I can see I’ll be hooked for hours reading. In fulfilling its mission of “Rescuing excess food for the hungry of Rochester”, CFR in 2009 is on track to equal or exceed 2008 accomplishments! In 2008, from our host church, Bethel Lutheran, CFR distributed meals to an average of nearly 1,200 families each month. The 1,200 represent about 3,500 hungry tummies. The total weight of food distributed in 2008 was nearly 100 tons, or from 13,000 to 17,000 pounds per month. From a pool of some 500+ CFR volunteers, about 20 folks every Monday, Wednesday, and Friday, picked up, received, sorted, and distributed meals for one day to about 100 families. Excess food is donated by about 25 organizations – restaurants, hospitals, schools, grocery stores, retirement centers, and businesses. CFR is an all volunteer organization with no paid staff. Food containers are CFR’s major expense, about $18,000 per year. This vital community service could not be accomplished without major financial support from funds, grants, and individuals. I casually asked my local Starbucks baristas if they got to eat the leftovers from the food counter at the end of the day. That’s shocking! Starbucks, which prides itself on being “green”, doesn’t donate their end-of-the-day surplus? Here in Manhattan, that must amount to literally tons of perfectly good baked goods, prepared sandwiches, small meals and fruits wasted every day. Some group needs to be strongly urging Starbucks to change this policy. I worked on an organic vegetable farm. We always had huge amounts of perfectly good unharvested veg in the field. But the bottleneck was the harvesting. We only have so many hours in a day and so many hands to pick and pack. A small organic veggie farm does not have much of a profit margin, so we couldn’t devote time to harvesting food for charity. A couple years ago the farm starting partnering with a local non-profit food bank. The food bank can then purchase the “extra” veggies from the farm at a reduced cost. That way the farmers aren’t losing money by donating the veggies, but rather are paid for the time it takes to harvest and pack them, but not any profit on top of that. I’d argue that this is only a partial solution, though, as the amount of unused good veg in the field is still very high after the food bank purchase/donation. And the amount of farmers’ time to harvest the charity veg still has to be small compared to that for the for-profit veg. The real solution is lots of volunteer (i.e. free) labor. Get volunteers out in the fields to “glean” all the extra good stuff, pack it, and get it to a food bank. But I haven’t discovered any organizations that organize such gleanings. I can tell you the farmers don’t have time to organize this sort of thing. Are there non-profits who do such volunteer mobilizations? There ought to be. Im a newyorker who has recently been moved to try and effect the issue of poverty and food loss in my area. I and a group of friends (10 of us) want to find a way to help on a regular basis but there seems to be no room to volunteer at soup kitchens or food pantries. Any suggestions about what we should do? DO YOU HAVE any way to tell me how much it could possibly cost to help food pantries and there shortages? i need some ideas on how we can get the people to donate food and is there any aritcals that talks about this problem there is so much on google. The efforts of Ronni Kahn and OzHarvest Food Rescue to redistribute meals to the homeless and hungry that would otherwise have been discarded reminds me of the tireless efforts of the volunteer community [10 Questions, WE Australian Magazine 31 Mar-1 Apr 2012]. One would have thought that OzHarvest Food Rescue and other volunteer organisations deserve more in-depth press than a succinct Q and A in the “People and Observations” column? Perhaps the volunteer community could be celebrated in a feature article in a future edition of the Weekend Australian Magazine? Furthermore food rescuers reaffirm for me the philosophy that all food comes from living beings or plants. To discard any food wastefully would be to show disrespect for the life that was sacrificed in its production. I am the gleaning director for CROS in S. Florida, and I coordinate volunteers to go to farmers’ field glean fresh produce every Saturday during harvest season. Last year we gleaned over 300,000 lbs and we will probably glean more this year. We glean produce such as tomatoes, potatoes, beans, cabbage, sweet corn, cantaloupe, cucumber, eggplant etc. We partner with the local food bank to provide the produce free of charge to local food providers such as Food Pantries, Soup Kitchens etc. composed by sbsbsb0416 I do like the manner in which you have framed this particular concern plus it really does offer me personally a lot of fodder for consideration. On the other hand, because of just what I have experienced, I simply hope when other reviews pile on that individuals continue to be on point and in no way get started on a tirade associated with some other news du jour. Anyway, thank you for this fantastic point and while I do not concur with it in totality, I respect your standpoint. Hello, I work for a major airline and was hoping you could point me in the right direction. The airline sells fresh food on most domestic flights, an incredible amount of food that isn’t purchased is thrown away. I would love to find a way to get this food to local food banks. As a community helper i thing it is a good idea to help those who in needy.I like to voluntee for ditribute food.